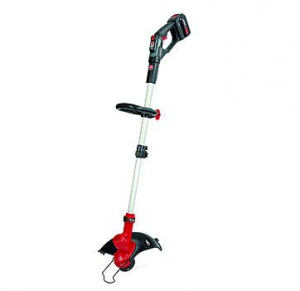 Cordless battery-powered trimmer or weed eaters have been around for many years. However, the main problem is that they weren’t great option for a long term care because batteries didn’t last long and they weren’t powerful enough. Today’s technology has changed cordless string trimmers. We can proudly say that it is the best options that you can use in order to maintain your medium-sized backyard. There are very powerful, and in some cases, they could be compared with gas-powered trimmers. The most important is that batteries will last longer and they are quite affordable. They can perform different functions and you can buy them with different attachments that could turn them into different tools so that your yard could look perfectly without using additional and expensive tools. It can trim hedges, edge, blow leaves and much more. It is an affordable and cheap option for your backyard, and at the same time they are eco-friendly which means there will be no harmful emissions. 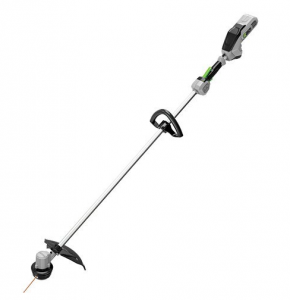 This great cordless string trimmer is the perfect product for your medium-sized lawn. At the same time it is a perfect switch from gas-powered trimmers that are louder, produce more vibrations and they are not eco-friendly. The first thing that we have to mention about this great trimmer is that contains improved packaging. It comes folded in half and in order to unfold it, you have to insert two screws and secure them with a wrench that is included in the package. The motor is brushless and contains more torque and power than the previous model. With 15’’ diameter path you will be able to cut more and with that additional cutting area, you will get the additional power that will drive the string through grass with enough force and speed to maintain your yard perfectly. It contains 56V 2.0 Ah battery, the same one that is compatible with EGO 56V cordless chainsaw, which means that you can use it on both models. On some online shops, you can purchase the cordless string trimmer without battery for a cheaper price, if you already have the chainsaw. It comes with battery retaining system and a lock-off lever that are more sensitive which will provide you better control than any other string trimmer. 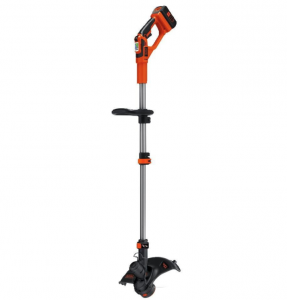 This particular string trimmer is perfectly designed to provide you many years of service. With the ergonomic feel and nice shaft, you will be able to enjoy without any additional problem. It won’t provide you additional vibration and what is most important it is quiet and therefore you can use it without interfering with neighbors. This is a great product for home use and even if you want to trim all day long because it won’t provide you fatigue and back issues like gas-powered string trimmers. It is lightweight, so it is great outdoor equipment that you can purchase for the affordable price. If you want to purchase string trimmer that is the perfect alternative to gas-powered trimmers, this is the perfect one for you. It will really do you quite well job. It is lightweight and with kept down noise. 9.0 amp hours will offer you great capacity and there will be enough power to maintain your medium-sized lawn. 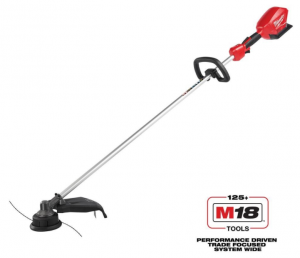 When we talk about fuel, you have to understand that it runs on M18 battery platform, which means that you can use any Milwaukee batteries that you have from other tools in order to power your cordless string trimmer up. It comes with 9.0 amp hour battery which is perfect if you compare it with previous models. Like any other battery-powered trimmers, this particular one contains two-speed settings. When you use low it will go up to 4600 RPM and for high 5800 RPM. You can manage these two speeds with speed trigger; however, you won’t be able to change speed during trimming. Which means that you have to turn it off in order to change the speed? You have to remove the hand from the trigger, change it and activate it again. It contains 14 and 16 cutting inches, and it could be adjusted to the desired length. With cutter screws you can remove the guard in order to get wider cutting swath; however, you can do it on your own responsibility. The main benefit and the reason why people choose this cordless string trimmer is that it contains reduced noise and emissions which became a requirement in certain states. DeWalt is great cordless string trimmer manufacturer that contains numerous different tools for maintaining your household. Even though they mainly focus on professional and heavy-duty string trimmers, this one is perfect for both medium and small yards. It is quite affordable and at the same time durable which means that you can work on it for years that will come. First, we have to mention that it is lightweight with 8.5 lbs. and well balanced ergonomic handle. Even though the shaft is longer than the previous version, the electric motor is quite powerful and it won’t tip the trimmer forward. The handle is padded which means that it is comfortable to hold. You will be able to adjust it up and down the shaft in order to rotate it during trimming. The shaft is 65’’ long in total, which is perfect for people with bigger height. When you first use it you will understand why other users are saying that it is sturdy and everything is tight and comfortable, which makes it great to handle. It comes with a brushless motor that has gear drive design in order to provide better cutting speed and more torque. Brushless motor will provide you higher efficiency and longer run time. It also has increased life span, three times longer than any other motor with brushes. It contains two power modes, low and high setting. On the low setting it works on 4600 RPM and on high it goes up to 6000 RPM. You can control the speed with a trigger that has variable control and you will be able to manage the performance by pressing. It runs on 20 Voltage Lithium-ion batteries which mean that it will be able to work for 40 minutes on low power and 20 minutes on high power settings. Charging takes up to one hour. There are many things that you can consider before you decide to purchase cordless string trimmers. This particular one is perfect for all kinds of works and especially for households. It maneuvers perfectly because it is lightweight. That is the main reason why you won’t have a problem with sour back and any fatigue. It has only 9 pounds, and if you are in good shape. It is very easy to use and you will be able to enjoy trimming no matter if you haven’t trimmed before. The main advantage is that it contains a 36-volt Lithium-Ion battery that is perfect for a longer period working and you will be able to finish your job simpler and quicker without changing them. It provides you a combination of quick change and power and it could be an edging tool with one slight shaft turn. It is quite adjustable and if you have any back problems, you can change the working position according to your own needs. It is quite comfortable, especially when you work for longer periods. The 36-volt battery in combination with built-in dial adjuster can cut difficult and thick weeds and bushes in your garden. This feature is called PowerCommand and it has the possibility to boost up to 6500 RPM for normal working and up to 8500 RPM if you want to use it for tougher jobs. It contains straight shaft and automatic spool feed which is far better than other string trimmers. The only frustrating thing is that you have to wait much longer for the battery to fully recharge. However, if you buy a fast charger as the additional tool, this cordless string trimmer can recharge for one hour. There are many different reasons why you should purchase this particular cordless string trimmer for your medium-sized backyard. Even though people that used gas-powered trimmers are a skeptic when it comes to cordless string trimmers, this line and model have similar capability as gas-powered trimmers which mean that it is the perfect alternative. When you first acquire it, everything could be put together in few minutes. You just have to snap all together and set head screw. When you first take it and use it will feel lightweight and very easy to adjust according to your height. That means that is perfect for people with back problems. It contains PowerCommand feature that will provide you better performance and power for lower battery life. There is a safety switch that you can use in order to limit the performance by depressing it with your thumb in order to pull it. Everything is pretty simple and quick, and you can release the safety button when you start trimming. It runs on impressive power that could be easily compared with gas-powered trimmers. It doesn’t matter if you enter the thickest part of your lawn you will feel the amount of torque that will be transmitted to the handle. You can easily cut thick weeds, ice plants, tall grass and woody reeds. Handles are padded for additional comfort and in combination with lightweight; it could be easily used by anyone. It is environment-friendly, which means that you can use it in areas where there is such a regulation such as California. Cordless string trimmers have changed in the latest decade, from a cumbersome tool that had low battery power to the lightweight, eco-friendly machine that could be compared with gas-powered trimmers without any difficulties. The performance is improved also and it is affordable, which is the most important factor in deciding which one you want to purchase. Yard Size – This is an important consideration that you must take before you choose cordless string trimmer. They can easily manage medium-sized lawns, however, if you have a bigger lawn with different and hard to reach edges that could be more expensive. Weight – You must bear the weight of cordless string trimmer and that is the main reason why you should choose the one that would be easy to maneuver and carry around the yard. However, you have to understand that price goes up as weight goes down. Battery Life – Most trimmers are powered with Lithium-Ion battery and they can run between 15 to 60 minutes of use. The important factor is the recharge time because it could take between 30 minutes and 2 hours. String Cutting Path – Cutting path has to be wide enough to clear large areas with one single sweep, and it has to be narrowed to tight places. The average path should be 12’’, but you can buy 10’’ also but you would need more time to finish everything. 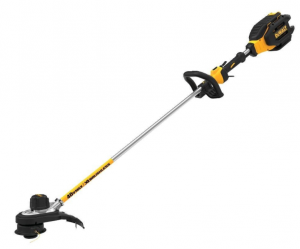 We have presented you a list where each best cordless string trimmer is the perfect for you. Most of them have similar features and price range, however, if you want to purchase string trimmer that will be comfortable, durable and powerful, choose any one of them and you won’t regret a minute.